The blank spaces in an album have sunk many a collector as soon as their good ship of philately is launched. Luckily, the day of buying a huge album and attempting to fill it with thousands of stamps as the primary way to collect are over. You are not denigrated, the way the collector of earlier days sometimes was, if you don't collect the world. There are those who still attempt to fill as many places in their albums as possible. You can recognize them as they buy large lots of used stamps to sort through. As one never completes a world collection, it is up to each different collector to decide how far they want to go. Most collectors specialize in one area, and now with desktop publishing within easy reach of anyone with a computer, album pages can be designed to the collector's specific needs. The extensive albums earlier collectors knew were selling far less than previously by the 1970s. With companies like Lindner and Hagner putting out attractive stock books with plastic see-through pockets many collectors voted with their wallets against frustration inducing preprinted album pages. Even those who specialize in a single country can be laid low each time they open their album and see those spaces where the high-value stamps go. They know they will likely never possess those gems and consequently face the dispiriting fact of an incomplete collection. If you troll eBay to find old albums full of stamps, you will be disappointed because most of the old albums are nowhere near filled. Many a worldwide album can be had for between $50 and $100 because they contain less than 10% of the stamps that would fill the album. The days of buying big lots of used worldwide stamps and filling albums with them -- a sort of solo philatelic bingo -- are now nearly gone. 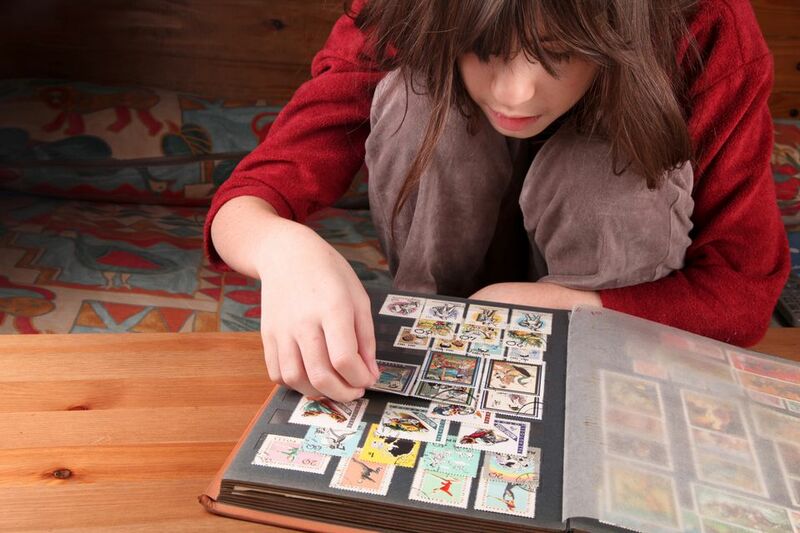 The great sense of a goal completed has much to do with the appeal of stamp collecting. Putting together a specialized collection of stamps one by one can give one a sense of continuity in life. There is no wonder that stamp collecting is seen as therapeutic. When the creative aspect of putting a collection together is not present and the main focus is on buying and owning, one is no longer a collector, but an accumulator. Boxes of stamps and covers that none can see and appreciate, lingering on shelves and in closets do not lend themselves to enjoyable stamp collecting. Some recognize the problem, becoming "kitchen table dealers." It is a term for those who are not actual dealers with a shop or a staff, yet want to sell their stamps in a semi-professional manner. eBay has made this much easier and without a doubt, there are many more of this breed of dealer than before the internet made becoming one so much easier. There are other ways one can collect and view stamps, without using pre-printed pages. A good way to avoid messy stamp clutter is to invest in some of the store/display items available. While these are not appropriate for actual stamp exhibiting, they do offer organization well beyond just throwing your latest acquisitions in a box that you may or may not get back to. Another real problem with the disorganization of the accumulation is the bad position you put relatives in after you've gone to the big stamp show in the sky. Dealers, as a rule, will not take the time to go through a mess to tabulate the value of your collection. Most will take a look at a small portion and tabulate approximate value. If you have valuable stamps and covers mixed in with average material, if your relative accepts the dealer's offer for your collection he wins and your relative loss. Don't try to blame the dealer; if you hadn't allowed yourself to form a messy accumulation rather than a nicely organized collection, your relative would be better off financially thanks to you.